As follows is the list of our 11 standard 100% Native UK Britsh Wildflower seed mixes. All the standard Wild flower seeds in our mixes are from UK production. They should be sown at 1.5 grams per square metre. See bottom of page for seed rate table. It can be difficult to get wild flower seed to establish into existing grass. Where it will work is when the grass is not too dense and it should not contain any perennial ryegrass. 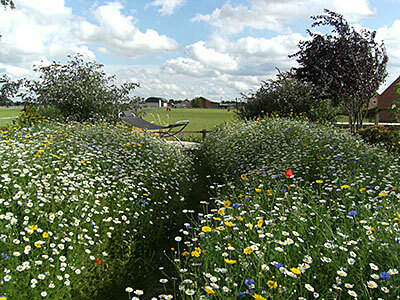 If you want to know how to establish a wild flower meadow then click on the advice section below. There are 17 different wildflowers in the mixture. Wildflower Seed mixture General Purpose. Wildflower seed mixture Loam Soils. Native British Wildflower seed mixture Clay Soils. 19 different wildflowers in the mixture. Wildflower seed mixture wetland areas. There are 18 wildflowers in the mixture. Wildflower seed mixture Pond side. Wildflower seed mixture. For sandy soil. 17 different wildflowers in the mixture. 14 wildflowers in the mixture. All the wildflower seeds are from native British UK seed stock. Most of the 100% UK wild flower seeds mixtures either match soil types. Such as WILD4 for loam soil or WILD9 for calcareous soils. Or other conditions such as WILD 6 wetland areas or WILD11 partial shade. We have 2 general purpose mixes of wildflower seeds these suit where you may have a mix of soil types. The difference between the two is that WILD1 has 10 wild flower species and WILD3 25. WILD2 will cope with most soil conditions but does particularly well on acid soils. All the native wild flower seeds UK we use are sourced as follows. It originates from wildflower seed stocks in the UK. It is then grown and harvested commercially in the UK. it is then mixed and dispatched in the UK by ourselves. This way you can be confident that the wild flower seeds you buy from us are from native UK origin. We are happy to design or quote for special bespoke wild flower seeds mixes We are signed up to and follow the Flora Locale Code of conduct.